Mary Kratt, a native of West Virginia, has lived most of her life in Charlotte, North Carolina. Her poems have appeared in numerous literary magazines and anthologies. She is a winner of the Brockman-Campbell Poetry Book Award, Oscar Arnold Young Poetry Book Award, Peace History Book Prize, St. Andrews Writer in Community Award, and the Irene Blair Honeycutt Legacy Award. Her nonfiction books feature the Piedmont region of the Carolinas. She taught English and American Studies at UNC-Charlotte and currently lives in Charlotte with her husband Jim. At last we have a substantial collection of Mary Kratt’s poetry. Clean-lined, economical, pointed, and soulful, these lyrics strike to the heart of things immediately, then linger with musical suggestion in the mind. “Farewell My Waterman Father” is one of the most touchingly quiet elegies I have ever encountered; “Eye Level with Pelicans” one the most spirited of celebrations. Watch Where You Walk is good advice—and the title of a fine book." The masterful and delicate way Mary Kratt guides a reader through the many worlds that come to bloom in her poems takes your breath. These poems pulse with people, their loves and losses, dreams and failures, joys, pleasures, hardscrabble work, all told in compelling narratives. Landscape and history are everywhere with description casting its spell, creating evocative moods and tone. The poet leads us down paths and roads that are both scarred and sacred to a fine wholeness in this collection which also has a subtle and robust humor in all the right places. If Kratt’s father is her Waterman, she is his river-keeper—of lives, of words, of verses flowing smoothly and effortlessly as water finding its path to the sea." 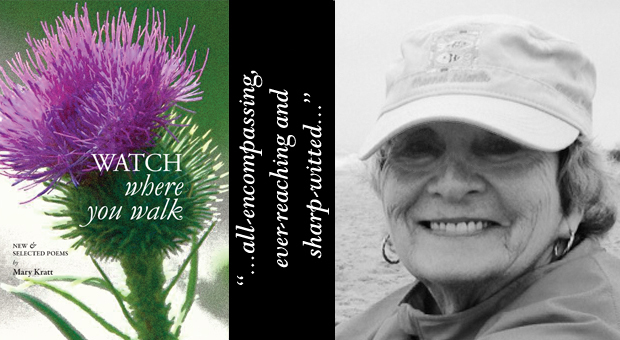 WATCH WHERE YOU WALK is not only Mary Kratt’s most important book of poems, but it is a book of signal interest to all of us who read and write poetry. It is the story of a family’s journey from the hills of West Virginia to the Tidewater and finally to the Piedmont of North Carolina. When we finish this book, we know ourselves and our world better. It is a beautifully crafted new book, where the new poems and the older poems interact and play against each other to create a world that did not exist before, complete in itself."